There’s been some buzz lately here in New York about fake signs cropping up in the NYC subway system. 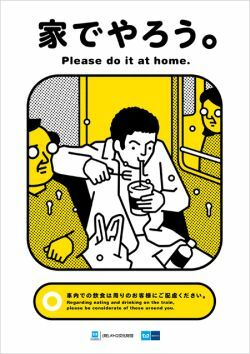 Designed to look like official decrees from the MTA, these posters instruct riders to avoid doing those ever-so-annoying things you’d be surprised people actually do, and quite often I might add, such as clipping their nails or singing along to their iPod while riding the trains. 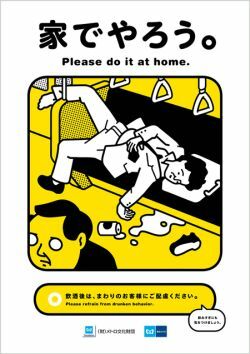 It turns out the Tokyo Metro has their very own similar signage, except these are for real, and quite a bit more entertaining. But I found a certain disturbing trend in them that I thought I’d share. 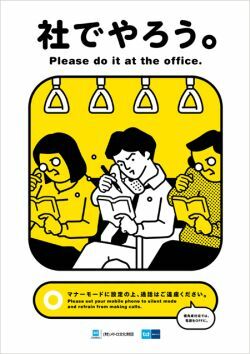 What do you think, is the Japanese Metro anti-traveler? Don’t the Japanese know we’re poor travelers, living off measly summer earnings or grandma’s birthday money, and the last thing we can afford to do is splurge on real food. Take away our ramen and you might as well put a bullet in our head. Do I have to repeat myself, we’re broke! We don’t have money for fancy things like beds or actual hotel rooms. That seat is totally not being used, and if I want to save $10.00 by shacking up on it for the next six hours, then that’s my prerogative. I paid for a ticket, didn’t I? Oh, that empty beer can. I swear, it was there when I got here. Not only do I have to call home ever other week to let Mom know I’m okay, I have to update my Twitter account, set my Facebook status, enter in today’s blog, and line up a hostel for tomorrow night. It’s okay for Ms. Librarian next to me to read, but I can’t get a little work done while I’m on my way home? And yes, I do wear a tie while traveling. It’s cool now, keeps the local police from hassling me. 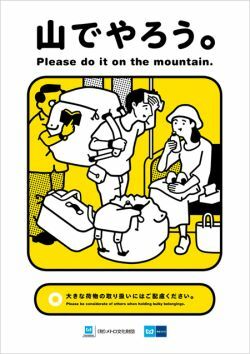 For the full list of this clearly bigoted signage, check out the Tokyo Metro’s site here, then read this funny anecdote they posted: ?? ?????????. Haha, classic!